When I first started teaching (what seems like many years ago now! ), I was fortunate to be able to live with some dear family friends who lived in the area of the school where I landed a position. The home of these friends was located away from the city, and so my drive into work every day involved travelling some country roads lined with fields and farms. I remember being struck in the fall season by the sudden sight of pumpkins in one particular corner field; it seemed that one day there was only green foliage visible above the earth, and then the next, the field was bursting with cheerful, orange globes as far as the eye could see. Suddenly becoming aware of what nature and the nurturing care of a farmer's hands had created while I wasn't noticing had a lasting impact on me. The sight of those pumpkins glowing in the early morning sun triggered feelings of warmth and contentedness at the beginning of a hectic day, and it's a visual I can still picture clearly in my mind's eye. It dawned on me in a local pumpkin patch recently that raising children is something like my experience with the corner farmer's field all those years ago. There are times when daily life with young ones gets so busy or challenging or mundane that it's like we're on automatic pilot, driving past a uniformly green field, not noticing anything remarkable at all, just trying to get to where we have to go next. Sometimes, though, there are glorious moments where the sun shines in just a certain way and we become aware of the gorgeous fruit of all of our efforts: our children, who are incredible, and beautiful, and who take our breath away when we have the chance to really "see" them. in what seems such a short time. 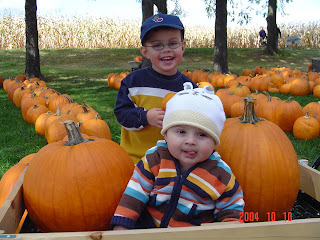 It's an amazing thing to suddenly notice that your children can now carry their own pumpkins instead of getting lost among the rows of orange orbs that are larger than they are, that they have grown into remarkable people, partly because it was in their nature and partly because of your loving care over the years. Those moments of clarity and wonder are the moments that make all of the more difficult parts of parenting so very worth it. I look harder now for moments to see my boys the way I saw those pumpkins one fall morning long ago, to suddenly notice something wonderful and inspiring about them, as if I'm seeing them for the first time. Whenever I do, I'm filled once again with feelings of warmth and contentedness. Happy Hallowe'en to you and all of your pumpkins, big and small!